The candidate shall undergo medical examination at the time of admission and produce fitness certificate along with declaration counter signed by parents that she does not suffer from any chronic disabilities like Arthritis, Asthma, or any such disability, which does not easily diagnosed during medical examination. However if a student will be suffering from any such disability within three months she shall be terminated and she shall have to bear the complete course fee. Psychiatric examination & vaccination status to be ascertained. The candidate shall deposit full amount of prescribed fees. Candidate will also deposit Rs. 3000/- as security money or produce Bank Guarantee (with our Banker) towards bond money to serve M.J. College of Nursing (C.G.) for a period of one year. The candidate shall be under obligation to complete 4 years B.Sc. 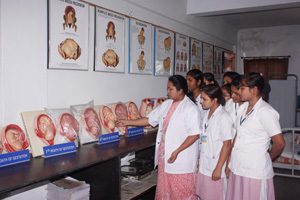 Nursing course in case of discontinuation, candidate will have to pay fees payable for remainder period. Students are required to give an agreement in the shape of bond for the payment of total amount of fee & other charges for the hole course that is payable for 4 year course of B.Sc. (N). As if student discontinue the course during the session is liable to pay the balance amount of fees and other charges of the whole course to the college. The candidate shall submit 8 copies of passport size photographs at time of admission.